This article is long so I’ll spare you a lengthy intro. Here’s everything you should need to know in order to dominate your Week 15 DFS tournaments and cash games. Note 1: All numbers in parentheses refer to a player’s salary rank on each site. Note 3: Your author is under the weather and apologizes for this article being less comprehensive than normal. Quarterback is tricky again this week, but Prescott is the clear top value on both sites. He’s the 14th-highest-priced quarterback on both sites, but ranks fifth among all slate-eligible quarterbacks in my rankings. He should also draw low ownership after last week’s dud. Tampa Bay is giving up a league-high 37.0 points per game on the road this year, and Prescott has also been much better at home. It’s no surprise then that Vegas is spotting them their highest implied point total of the season at 7.8 points over their per game average. Over the full season, Tampa Bay ranks fourth-worst in fantasy points allowed per game, second-worst in fantasy points allowed per dropback, and worst in opposing passer rating. Despite flopping last week, Prescott still ranks fourth-best in fantasy points per game (20.8) since Week 6. Other: Matt Ryan (DK: QB9, FD: QB2) is a top play on DraftKings this week, and so is (as gross as it sounds) Taylor Heinicke (DK: QB45, FD: QB26) at stone-minimum. The Falcons are giving up the most fantasy points per game to opposing quarterbacks and Panthers are giving up the fifth-most (schedule-adjusted) over the last five weeks. Vegas says this game has shootout potential (spread within +/- 3.0) and though Heinicke is an unknown, Ryan quietly ranks third at the position in fantasy points per game. Ryan might be my favorite play at the position on DraftKings this week and Heinicke is risky but makes sense as a salary saver. … Drew Brees (DK: QB3, FD: QB4) and Ben Roethlisberger (DK: QB1, FD: QB1) are in play given their established tournament-winning upside and the lofty over/under in their game. … Since returning from injury in Week 12, Josh Allen (DK: QB13, FD: QB12) leads all quarterbacks in fantasy points scored. This week he gets a New England defense that ranks fifth-worst in schedule-adjusted fantasy points per game allowed to opposing quarterbacks. The two mobile quarterbacks they faced (Mitchell Trubisky and Deshaun Watson) combined for 14 carries, 121 yards, and a touchdown on the ground. … Andrew Luck (DK: QB7, FD: QB5) deserves consideration given his production throughout the season, but I’ve faded almost every quarterback against the Giants this year and have been better off because of it. … Baker Mayfield (DK: QB9, FD: QB11) gets a soft Bengals pass defense (second-most fantasy points per game allowed) but I bet the Browns go run-heavy, as usual. Outside of the bizarre week that was Week 15, paying up for the league’s rare few bell-cow running backs has been a winning strategy all year. This week, that leaves us with Todd Gurley (DK: RB1, FD: RB1), Ezekiel Elliott (DK: RB2, FD: RB4), Christian McCaffrey (DK: RB3, FD: RB2), and Saquon Barkley (DK: RB4, FD: RB3). Nick Chubb (DK: RB6, FD: RB8) might also deserve consideration within that tier given matchup, as would Joe Mixon (DK: RB7, FD: RB6) and Dalvin Cook (DK: RB9, FD: RB11) given recent usage and production. Gurley’s injury leaves me off him outside of as a potential contrarian play. 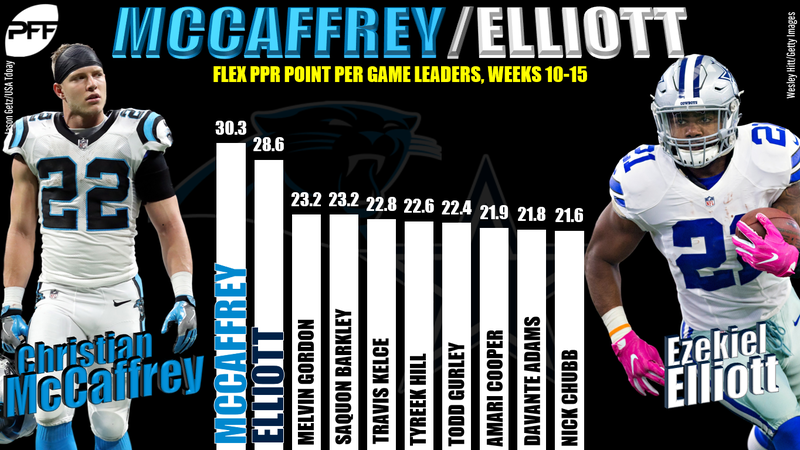 Over the past six weeks, Elliott and McCaffrey rank first and second (and by a significant margin) among all players in both expected and actual fantasy points per game. McCaffrey was more productive, while Elliott has seen the better usage (and really all-decade great levels of usage). Ideally, Elliott will draw lower ownership this week, after a somewhat disappointing outing last week. That was his absolute floor (19.8 fantasy points) in a surprise shutout. This week, Vegas is giving Dallas a 27.5-point implied total (7.8 points above their point per game average) up against Tampa Bay, who are giving up the fifth-most fantasy points per game to opposing running backs. McCaffrey (the league’s best pass-catching running back) gets an ideal matchup as well, up against an Atlanta defense that has given up the most receptions to opposing running backs in every year of Dan Quinn’s head coaching tenure. They also rank worst in schedule-adjusted fantasy points per game to opposing running backs. I suppose Heinicke starting dings McCaffrey, but I’m not sure it’s by much at all. Over the last two weeks, Mixon leads all players in expected (27.1) and ranks second in actual fantasy points per game (26.1). Over the last three weeks Cook ranks fifth at the position in fantasy points per game (22.4). Over the full season, he also leads all of 75 qualifying running backs in missed tackles forced per touch (0.26). However, for the both of them, I do have some gamescript concerns that I outlined here. Chubb ranks top-six in both yards per carry and PFF grade, but is probably a tad overpriced based on expected volume. Still, the matchup couldn’t be better against Cincinnati. The Bengals rank third-worst in yards allowed per carry, second-worst in rushing fantasy points per game allowed, and second-worst in schedule-adjusted fantasy points per game allowed to opposing running backs (both over the full season and over the last five weeks). Of the mid-tier running backs, I’m only looking at Marlon Mack (DK: RB15, FD: RB13) and Jaylen Samuels (DK: RB10, FD: RB17) (assuming James Conner is out). In two games without Conner, Samuels has played on 71% of the team’s snaps and totaled 90% of the team’s RB expected fantasy points. Despite failing to find the end zone in both games, he ranks 13th in both expected (16.2) and actual fantasy points per game (17.7). By all accounts, the matchup is tough, but the over/under is high (highest on the slate by 4.5-points) and Samuels should be held afloat by heavy target volume. With Aaron Jones out, Williams is likely to assume the bell-cow workload he saw last week (87% of the snaps) and at the tail end of last year. From Week 11 to 17 in 2017, Williams played on 91% of the snaps. Over that seven-game span, Williams averaged 18.7 carries, 4.7 targets, 18.3 expected fantasy points, and 19.0 actual fantasy points per game. By all accounts, these are RB1 numbers. Keep in mind, Aaron Rodgers played on only 15% of the snaps over this span. So, even if Rodgers sits (unlikely), Williams will still be a top value. Over the last two weeks, McGuire has played on 74% of the snaps, while ranking top-15 among running backs in both expected (17.0) and actual fantasy points per game (16.7). He comes off of a tough matchup against Houston (second-best in yards allowed per carry) to face a more neutral Green Bay defense this week. 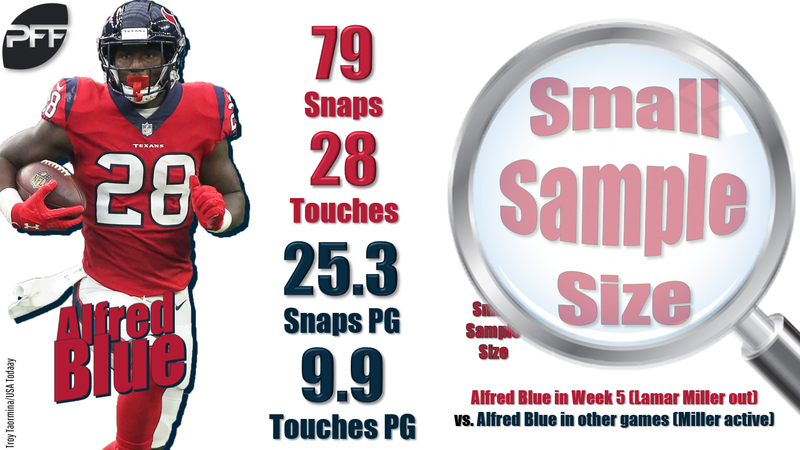 Lamar Miller played on only 11 snaps last week, while Blue played on every snap but one following his exit. In total, Blue saw nine carries and two targets. The last time Miller sat out (Week 5), Blue played on 79 of 80 snaps, while drawing 20 carries and eight targets. That week, he ranked fourth in expected fantasy points (23.9), with decent production, scoring 19.9. If Miller sits, I’m expecting a bell-cow workload from Blue once again, against a Philadelphia Eagles defense that is giving up the most schedule-adjusted fantasy points per game to opposing running backs (and by a landslide) over the last five weeks. All of DeAndre Hopkins (DK: WR2, FD: WR1), JuJu Smith-Schuster (DK: WR6, FD: WR6), and Julio Jones (DK: WR1, FD: WR2) are in ideal matchups, but all three are also game-time decisions. T.Y. Hilton’s (DK: WR12, FD: WR8) matchup is less attractive (but still not below average), but he is a stronger value and leads all wide receivers in yardage (by 101) since Week 11. He too is a game-time decision. Davante Adams (DK: WR3, FD: WR4) and Adam Thielen (DK: WR7, FD: WR9), otherwise, are healthy. Let’s go through each one individually. Hopkins gets an Eagles defense that ranks worst in fantasy points per game allowed to outside wide receivers. They rank second-worst in schedule-adjusted fantasy points per game to all wide receivers. Hopkins is our top-graded wide receiver and has had one of the league’s toughest cornerback schedules to date. Over the last four weeks, Smith-Schuster leads all wide receivers in expected fantasy points per game (22.1) and ranks third in actual fantasy points per game (21.4). He has an ideal matchup this week, up against the Saints. New Orleans is likely to have Marshon Lattimore (our 24th-highest-graded cornerback) shadow Antonio Brown, leaving Smith-Schuster in the far more favorable matchup against Eli Apple (our No. 65 cornerback). The Saints are giving up the most schedule-adjusted fantasy points per game to WR2s and the second-most fantasy points per game to outside wide receivers. However, if Smith-Schuster is out, Brown becomes a top play – despite the Lattimore shadow. Jones ranks fifth in fantasy points per game since Week 11, and now gets a Carolina defense that is giving up the seventh-most fantasy points per game to outside wide receivers, and the fourth-most schedule-adjusted over the last five weeks. Since 2015, he averages 126.9 yards per game against Carolina (seven games). Adams gets a Jets defense that ranks worst in schedule-adjusted fantasy points per game (over the full season and over the last five weeks). Despite having what’s probably been the league’s toughest cornerback schedule, Adams has been one of the league’s most productive and most consistent fantasy players. Now he gets an ideal matchup. If paying up for a wide receiver, Adams is my top option. 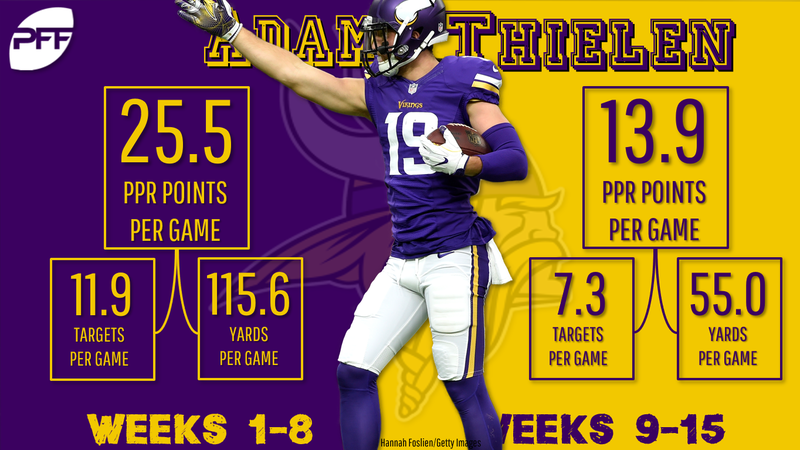 Thielen led all wide receivers in fantasy points per game (25.5) through the first eight weeks of the season but ranks just 22nd (13.9) since Week 9. He’s also coming off of his worst outing of the season – a two-target, 3.9-point game against the Dolphins. Though risky and only in play as a contrarian option, I see this as a “get-right” spot for him. With Stefon Diggs in shadow coverage against Darius Slay, Kirk Cousins would be wise to lean heavily on Thielen up against a Detroit defense that is allowing the seventh-most fantasy points per game to opposing slot wide receivers. Since Cooper Kupp’s season-ending injury, Woods ranks fifth-best among wide receivers in expected fantasy points per game (19.0). He’s also run 71% of his routes from the slot over this span. This means avoiding Patrick Peterson’s coverage and working against Arizona where they are weakest – the Cardinals are giving up the sixth-most fantasy points per game to opposing slot wide receivers and the seventh-fewest to outside wide receivers. Cooper was fantasy’s most boom-or-bust player in 2017, and he’s reprised that role in 2018. He “boomed” in Week 14 and then “busted” in Week 15, but his fantasy point per game average (21.9) since joining the Cowboys still ranks third-best at the position. We should be seeing another “boom” game from him this week, up against a Buccaneers defense that ranks second-worst in schedule-adjusted fantasy points per game allowed to opposing WR1s. He’s also still way too cheap on FanDuel. In Week 15, Anderson ranked fourth in expected (24.3) and fifth in actual fantasy points per game (22.6). Over the last four weeks, Anderson ranks 11th in expected fantasy points per game (16.4), but just 22nd in actual fantasy points per game (13.3). Of course, that would still make him a value this week, but his inefficiency here makes a lot of sense when considering the cornerbacks he’s faced over this span. He drew shadow coverage from three of our top cornerbacks over this stretch: Stephon Gilmore in Week 12, Adoree’ Jackson in Week 13, and Tre’Davious White in Week 14. Houston (in Week 15) was his first soft matchup since Week 5 and his first non-shadow game since Week 6. Luckily, he gets another favorable matchup this week, against a Green Bay defense that ranks ninth-worst in fantasy points per game allowed to opposing outside wide receivers, and sixth-worst in schedule-adjusted fantasy points per game allowed to opposing WR1s. Jaire Alexander might shadow, and he’s graded well, but in his only two shadow games this year he’s given up 10 receptions, 172 yards, and a score. By my calculations, having Nick Foles under center means a boost of about 1.5 fantasy points per game for Jeffery (from 13.5 to 15.0). This makes him a top value up against a Houston secondary that’s allowed the eight-most fantasy points per game to outside wide receivers (where Jeffery runs 80% of his routes). Over the last four weeks, Pettis ranks seventh at the position in fantasy points (18.7), while averaging 84.5 yards and 1.0 touchdown per game. His lack of volume over this span (5.5 targets per game), implies a looming regression, but he might still be a strong value. He’ll also go overlooked with many DFS players thinking this matchup is much worse than it is. The Bears are giving up the third-most fantasy points per game to opposing left wide receivers (where Pettis runs 44% of his routes). Over the last four weeks, Foster ranks seventh among wide receivers in actual fantasy points per game (14.8), but just 59th in expected fantasy points per game (8.6). This implies an impending regression to the mean, but it’s also hard to ignore that level of production. Additionally, he should also see an increase in targets this week, with Zay Jones likely to draw shadow coverage from our top-graded cornerback (Stephon Gilmore). 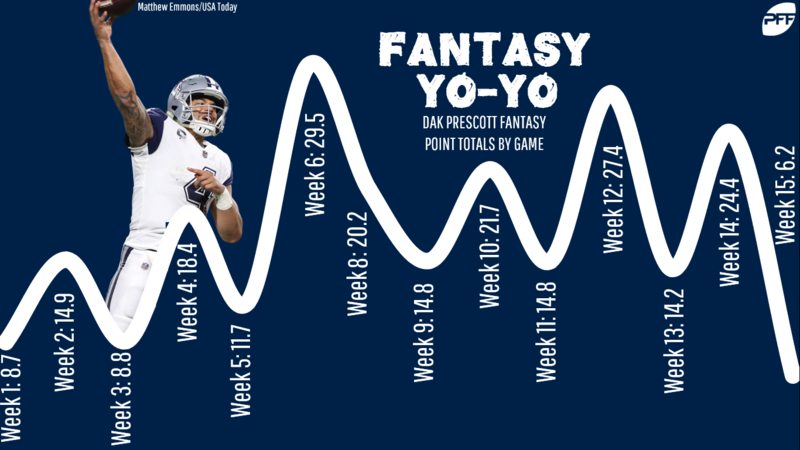 Other: The production hasn’t been there for Josh Reynolds (DK: WR22, FD: WR36) in recent weeks, but volume has been strong since the team lost Cooper Kupp in Week 10. Over this span, he averages 16.0 expected fantasy points per game, ranking 13th among all wide receivers. He’ll be a low-owned boom-or-bust value play against Arizona this week. Target-volume should be better than typical too, with Brandin Cooks likely to be shadowed by Patrick Peterson. … Believers in the backup connection should keep an eye on Curtis Samuel (DK: WR34, FD: WR27). This preseason, Samuel was Taylor Heinicke’s favorite receiver. He saw a 25% target market share and a 38% yardage market share when Heinicke was under center… Julian Edelman (DK: WR11, FD: WR15) is a better play than typical with Josh Gordon gone. He’s priced below his average score on both sites and will be avoiding Tre’Davious White in the slot – where Buffalo is giving up the 12th-most fantasy points per game. This didn’t pay off last week, but paying up for tight ends has returned good value for most of the year. All three of Zach Ertz (DK: TE2, FD: TE1), George Kittle (DK: TE1, FD: TE2), and Eric Ebron (DK: TE3, FD: TE3) look like values on DraftKings. Ertz is the best value, ranking 20th among receivers in salary, but 12th in DraftKings fantasy points per game. Kittle ranks 19th in both salary and DK fantasy points per game. Ebron ranks 23rd in salary and 21st in DK fantasy points per game. Ebron is also the best value on FanDuel, ranking 26th among all receivers in salary, but 19th in DraftKings fantasy points per game. Ertz has been less productive with Nick Foles under center, but volume has been significantly better than with Carson Wentz. This week he gets a Houston defense that ranks fourth-worst in schedule-adjusted fantasy points per game to opposing tight ends. Kittle is a tough sell against Chicago, but still warrants consideration. Since Week 10, he ranks 13th among all receivers in targets per game (8.8) and 14th in fantasy points per game (16.8). Among tight ends, only Travis Kelce ranks higher. Ebron is probably the best value overall, but is not without risk, coming off of a 1.8-point performance in a run-heavy blowout against Dallas. His matchup against New York should have a similar outcome. Still, if only counting games without Jack Doyle, Ebron ranks first among tight ends and 10th among all receivers in expected fantasy points per game (16.9). He has heavy touchdown upside in a week Indianapolis should be gifted plenty of good field position and red zone drives, but also carries a good deal of risk. Over the last two weeks with Odell Beckham Jr. out, Engram leads the team in targets by four (17 total) and receiving yardage by 98 (152 total). 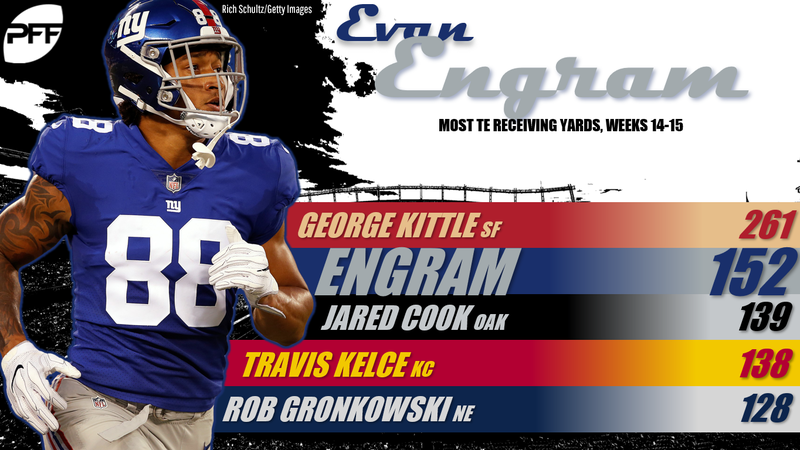 With Beckham out again, I like Engram’s chances at another big game this week. Indianapolis ranks second-worst in schedule adjusted fantasy points per game allowed to opposing tight ends (both over the full season and over the last five weeks).